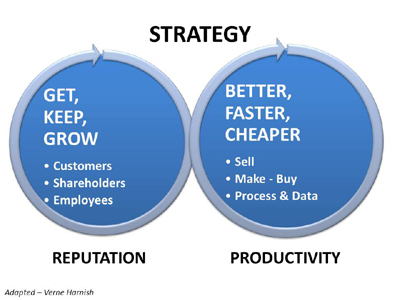 “Mastering the Rockefeller Habits – What you must do to increase value of your growing firm” by Verne Harnish was referred to me by an entrepreneur who thought it was my style of book: pragmatic, full of useful tips and to the point. He was on the money, in fact I found the book addictive – I could not put it down. For me it went well beyond the promise of another one page business plan template to consider, its goes on my top 10 must read business books list. What I liked was the way Verne brings business strategy and plans back to simple lists, questions and statement. Below I have given you a taste of what is in this great read. Are we doing those three things right? Let’s face it, business is basically the act of Getting, Keeping and Growing – Customers, Staff and Shareholders and we get better at this when we sell stuff, make or buy stuff and measure stuff. Verne has simplified all business strategy into two dimensions best illustrated with the diagram below. Often in business we can make things more complex than we need to. Verne’s one page business plan and measurement framework is well worth exploring. 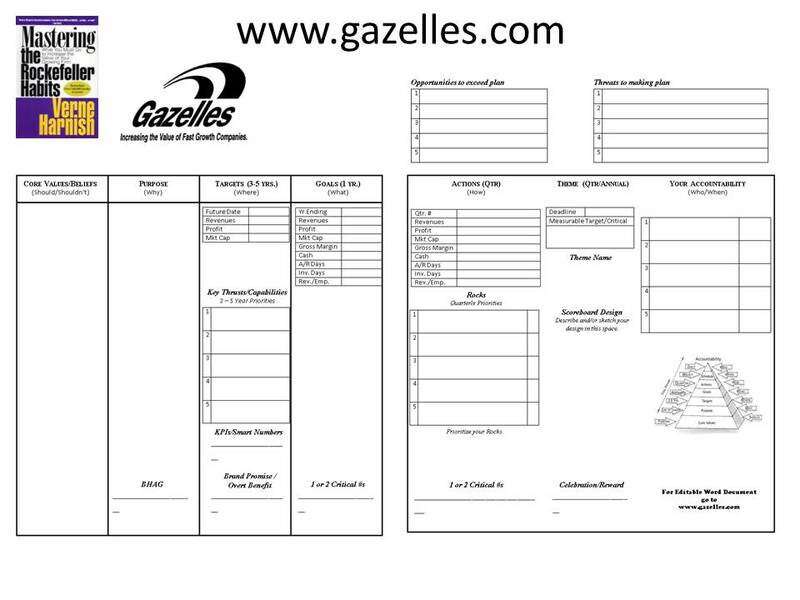 Note: you can download a word version of Verne’s one page plan from www.gazelles.com. For me it’s not necessarily the exact template as much as the principles behind concise “Succinct” business plans and measurement models. Develop a habit of using the framework and a language to continually evaluate process. (Like the GMC guide to NO). This one pager is a good mix of strategy, execution and measurement and complements the business model canvas and balanced score card approach I use. My take is, you need to work with a model that works best for you, perhaps a hybrid of all of the above. Verne also shares his philosophy on people and management – including effective use of meetings. We have all heard people say they don’t need help; Verne says it all “if your staff do not have bottlenecks, then more than likely they aren’t doing anything at all”. As a manager always find out your teams top 3 -5 bottlenecks, remember that it’s your job to clear those. Oh and the link to “Rockefeller”…. well to be honest, you’ll need to read the book for this, for me it got lost in all the great gems I took from the book on how to help companies grow fast. This entry was posted in A GMC Top Tip, book review, business plans, Reading List, Startup 101 - Building Great Companies and tagged book review, business plans, startup, strategy by Mark Robotham. Bookmark the permalink. Yes, there in lies the biggest talent of all – getting that succinct clarity. For me the best thing about these summarised plans is that people are more likely to challenge and discuss them. Which is great because they do not sit on the shelve gathering dust. They become part of concious decision making. Oh btw … I think it was mark twains quote – I use it all the time in my pitching workshops.